U.S. Sen. Amy Klobuchar (D-Minn.) said she's hopeful for vote this year on MBL legislation. Sen. Amy Klobuchar at the MnCUN session in St. Paul. 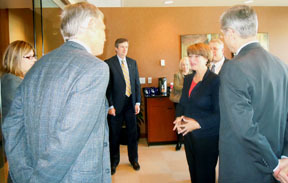 U.S. Sen. Amy Klobuchar (D-Minn.) met last week with a group of credit union leaders at the Minnesota Credit Union Network headquarters in St. Paul to discuss industry issues and legislative matters surrounding the elections.